Passive income basically means to generate an income, or an additional income that requires little to no work. No no, it's not just 5 minutes of work for an unlimited supply of money (although I wish it was), it's about putting in the hard yards first to reap the juicy juicy rewards later on. Now, let's look at 4 easy types of passive incomes that I myself have set up and still currently reap those juicy rewards from. E-books are a fantastic passive income source, as they may require a lot of time initially but after creation you get paid every single time someone purchases that book, for the rest of your life. Setting up a E-Book is relatively cheap also. Once you've selected your topic and written you book (even in a word document) you can get it professionally proofread and have a graphic designer design you a digital book cover for less than $50. You can find skilled freelancers on fiverr.com to do this for you. Now you need somewhere to sell it... You can use amazon publishing who will host and advertise your book for you. The benefit is, there is no monthly costs associated with selling your book this way, and amazon will only take a % every-time a copy is sold. Alternatively, If you have some web development skills or have some experience with ClickFunnels, you can also set up your own website and drive traffic to it. However, they're monthly hosting/domain costs associated with having your own website, plus you will be responsible for finding a way to keep your digital book secure from being published elsewhere, and also will cop a % fee from your payment gateway provider (stripe or paypal for example). Let say you invest 100 hours into writing a simple guide style book. Over the course of a year you sell 500 copies at $7.99 each. You just made around $4000 per year for only 100 hours of initial work. Not too shabby. Affiliate links are very easy to understand are super easy to manage. Basically you promote someone else's product through a link on either your blog, social media, or website. Every time some clicks that link and decides to make a purchase, and you get to keep a percentage of the profits. Even though you might only make $2-$3 per person you refer, times that by a couple hundred people per month and your laughing. 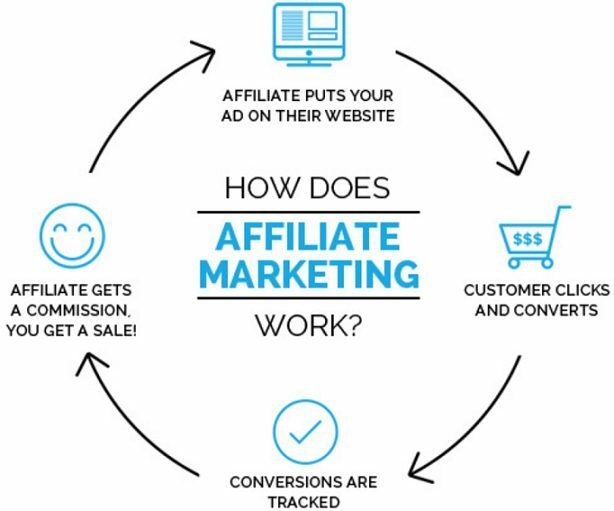 Either way, affiliate links are a fantastic additional income boost and if you have 10-20 of them running for you at any one stage, you can make a substantial amount of dollar bills. Shopify has a great affiliate marketing program I recommend you check out, if you're looking to get started. You can find that here. This is a style of passive income I've recently started dabbling in myself and have found myself becoming more interested in every day. Let me start by saying, this style of 'passive income' requires capital to start with and has a lot more 'risk' then the other two mentioned so far, but if done correctly can be used as a long time investment to make some serious cash. A dividend return is basically a sum of money paid regularly throughout the year by a company to it's share holders. The more shares you own, the more you receive in dividends. As an example, 'Coke' stocks are currently around $9.10 USD and pay a dividend return of about $1.25 per year. This means over the course of 8-9 years you'll have received back your entire investment in dividends, plus you'll still own all the stocks you hold in 'Coke'. Where dividends get interesting is when you set yourself up with a dividend reinvestment strategy. This basically means that instead of you receiving tour dividend payments in deposits to your bank each year, that money is re-invested into buying more stocks (within that company), and usually at the lowest price. This allows your stocks to compound each year, which results in your dividends increasing also. This exponential cycle keeps increasing and getting larger each year, increasing the amount of dividend payments you receive. As an example, a current $20,000 investment in 'Coke' shares, would result in an estimated yearly dividend payout of $85,000 in 20 years. (Plus you'd still own all your shares). If you're looking at getting started with Dividends and Dividend Reinvestment Strategies, I recommend having a chat with Commsec and discussing your options. Whilst I rarely 'dropship' anymore, I have done this for years through various e-commerce channels and made quite a nice little bonus on top of my other income streams. This method requires absolutely 0 capital to begin with, however it relies heavily on a mixture of luck and hard work. If you aren't familiar with dropshipping, it basically just means you sell someone else's product through your own website, except at a higher price. When a customer makes a purchase, you purchase it from elsewhere, at a cheaper price and then have it shipped to them. You retain the difference in cost as profit. Why does this work though? Well basically, most people don't realise that all the products they see and then buy from someone on Instagram or Facebook are actually dropshipped from China. The companies usually advertise those products under their own brand name and have their labels attached to the product in China before it gets shipped out. The way to successfully 'dropship' involves finding a niche people are interested in and consistently purchase from, build a brand around it, then drive traffic to your website and make the sale. The benefits include no need to purchase or 'hold' stock, and $0 in capital required to make a start. The most successful dropshippers focus on recent trends and fashions and update their store accordingly. As an example, I sold hoodies with the 'Fortnite' logo on them through my website, I used instagram ads to grab peoples attention who were interested in the game 'fortnite'. Once the customer jumped on my website and purchased the hoodie(s), I had an app automatically copy the customers details and order that from my supplier in China. I retained the difference in cost and my selling price as profit. There are thousands of YouTube videos about dropshipping and I suggest you absorb as much information as you can before getting started. With a combination of 3-4 of these methods working for you, you can generate a very nice surplus to your regular income, or even surpass the need to have your regular income all together.